In recent centuries England has been a major actor in illicit business, from rewarding Sir France Drake for piracy to invading and compelling China to buy opium. The grandfather of Franklin D. Roosevelt, a partner in a Boston trading company, also made a fortune as Americans and French joined the British in forcing China (and some corrupt Chinese officials) to legalize the opium trade. But the reach and impact of illicit commerce are being ramped up by modern technology. Purveyors of illicit goods—from rhinoceros horns to luxury handbags (both fake and genuine) to deadly drugs—use the Internet to entice and sell their products to customers who are quite aware or ignorant of what they are buying. Author Louise I. Shelley, an historian at George Mason University, devotes a chapter to rhinoceros horn poaching and trading as a case study in crime. Trade in exotic wildlife as well as in human trafficking threatens the quality of all life and accelerates the extinction of many species. Illicit as well as licit trade in arms and other ingredients of war is fueling conflict within and between states. North Korea continues its weapons of mass destruction programs using flags of convenience and sometimes with no flags at all. Pyongyang is also renowned for its skill at counterfeiting $100 bills. Shelley explores illicit trade in tangible goods—drugs, human beings, arms, wildlife and timber, fish, antiquities, and ubiquitous counterfeits—and contrasts this with the damaging commerce in cyberspace, where intangible commodities cost consumers and organizations billions as they lose identities, bank accounts, access to computer data, and intellectual property. What to do to dampen the wheels of illicit commerce? Shelley offers many positive suggestions, but none seem likely to lessen human cupidity and the enormous powers spawned by computer science and engineering. 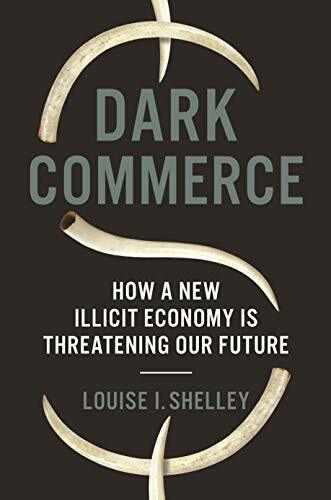 Professor Shelley has written a deep and wide-ranging tour of the historical and present-day horizons of dark commerce. Having absorbed the big picture, an interested reader could examine in detail the life and career of one individual who used the internet as well as traditional violence to control a large part of the world’s drug trade: Paul Colder Le Roux, whose story is masterfully told by Evan Ratliff in The Mastermind: Drugs, Empire, Murder, Betrayal (Random House, 2019). A similar tale tells how one man, Ross Ulbricht, used a computer in his Austin, Texas bedroom to develop a “Silk Road” for drugs and other illicit goods: Nick Bilton, American Kingpin: The Epic Hunt for the Criminal Mastermind Behind the Silk Road (Portfolio/Penguin, 2017).